Introduction: Iron is one of the most important micronutrients that play a vital role in hemoglobin (Hb) synthesis, cellular metabolism, and psychomotor function in humans. Iron deficiency is a major cause of anemia worldwide, particularly in children. The nomadic Fulanis have a migratory lifestyle determined by the availability of water and pasture for their livestock, making them difficult to reach, thus the paucity of knowledge on their health status. Objectives: To assess the Hb concentration, red cell indices, serum ferritin, and transferrin receptor levels among nomadic Fulani children in Ladduga grazing reserve of Kaduna state, Nigeria. Materials, Subjects, and Methods: This was a cross-sectional, descriptive study using questionnaires and physical examination of 340 children (5–15 years). Their complete blood count was determined by automation; serum ferritin and soluble transferrin receptor (sTFR) levels were assayed using enzyme-linked immunosorbent assay technique. Data obtained was analyzed using SPSS version 20.0. Level of significance was set at P ≤ 0.05. Results: The prevalence of anemia was 40.3%, which was significantly higher among the children aged 5–9 years (54.7%) compared to 30.5% in the 10–15 years age group (Z-statistic = 4.5, P= <0.001). Iron deficiency anemia was observed in only 19 (5.6%) of the study population. Median (interquartile ranges) serum ferritin and mean ± standard deviation sTFR levels were 56.0 (55.8) μg/L and 34.73 ± 14.29 nmol/L, respectively. Majority (77.4%) of the participants had normal iron stores and only 18.8% had low stores. Among the 137 participants with anemia, 19 (13.9%), 76 (55.5%), 102 (74.5%), and 76 (55.5%) had serum ferritin <30 μg/L, sTfR > 28.1 nmol/L, mean corpuscular volume <80 fl, and mean corpuscular hemoglobin <27 pg, respectively. Conclusion: There is a high prevalence of anemia among nomadic Fulani children at Ladduga grazing reserve. However, iron deficiency is not the only cause of anemia. Background: Globally, sickle cell disease (SCD) is the most common inherited disorder, with Nigeria having the greatest burden of the disease. SCD was thought to be a disease of childhood because many died early in life from related complications. However, advances in SCD treatment have altered its course such that the majority of children are living into adulthood. Individuals with SCD suffer increased school absenteeism, poor school performance, increased hospital visits, and increased hospitalization, thus affecting their quality of life (QOL) compared to normal individuals. Subjects and Methods: We conducted a hospital-based, descriptive, cross-sectional study among 120 individuals with SCD attending hematology clinic in a tertiary hospital, selected using systematic sampling technique. Pretested, structured, interviewer-administered questionnaire adapted from RAND's Short Form-36 was used for the data collection. Completed questionnaires were coded, and data were entered into SPSS software version 23.0 for analysis. Univariate and bivariate analyses were conducted among variables. Associations between categorical variables were tested for significance using Chi-square test and Student's t-test. Statistical significance was said to be achieved where P < 0.05. Results: A total of 120 participants were studied with an age range of 10–45 years and a median age of 20 years. Majority (54.2%) of the participants were in the age group of 10–20 years. In addition, 13 (10.8%) perceived their general health status as poor, whereas 71 (59.2%) had the perception of falling sick easily, than the normal individuals. The Health-Related Quality of Life (HRQOL) scores for the eight domains are as follows: bodily pain (62.3 ± 24.3), physical functioning (56.7 ± 25.5), physical role limitation (32.1 ± 37.7), social activities (59.5 ± 27.4), general mental health (42.0 ± 39.7), emotional status (59.1 ± 14.1), vitality (52.9 ± 13.1), and general health perceptions (50.8 ± 21.1). Conclusion: We found that the QOL of individuals with SCD is generally poor in all the domains of HRQOL, especially in the areas of role limitations due to physical and emotional health. Therefore, in addition to measures taken to reduce SCD complications, other interventions should target improving their physical and emotional health. We also recommend improving HRQOL among all the other domains as a clinical end point. Background: Temporomandibular joint (TMJ) ankylosis is a condition associated with restricted mouth opening. Following induction of general anesthesia, airway obstruction may occur leading to “can't ventilate and can't intubate scenario.” The anticipation of difficult airway and choice of appropriate intubation techniques usually prevent anesthetic morbidity and mortality. Patients and Methods: Both the surgeons' and the anesthetic review, as well as the anesthetic chart of the 36 patients managed at Ahmadu Bello University Teaching Hospital between January 2006 and December 2017, were studied. Data collected were bio-data of the patients, extent of mouth opening, and the techniques of intubation used. Results: The mean age of the patients was 26.9 ± 1.64, with a male to female ratio of 1:1.1. There were more male 19 (52.8%) than female 17 (47.2%). 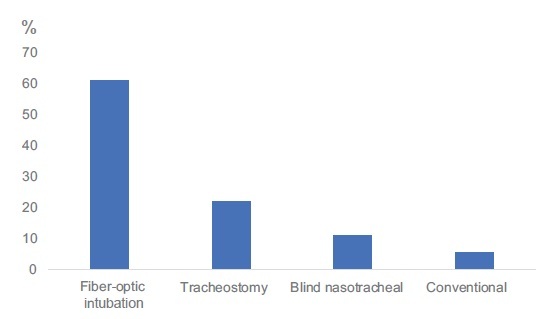 Tracheal intubation was achieved with the aid of nasal fiberoptic technique in 22 (61.1%) patients, 8 patients (22.2%) were intubated by tracheostomy, 4 patients (11.1%) were intubated by blind nasal intubation, while 2 patients (5.6%) required endotracheal intubation through conventional oral laryngoscopy. The interincisor gap was between 0 and <1 cm in all the patients which indicated significantly restricted mouth opening, with an average of zero interincisor gap. Conclusion: Fiberoptic intubation was the most used approach of achieving tracheal intubation in patients with TMJ disorder. Introduction: Clefts lip and palate are the most common deformities in the head-and-neck region. They vary in the severity of presentation from small notches in the lip to clefts that extend through the alveolar ridge in the mouth and involve the floor of the nostrils/palate. They may either occur in isolation (asyndromic) or in association with other congenital anomalies as part of a syndrome as observed. Patients and Methods: This is a retrospective clinic-based study of records of patients seen with orofacial clefts from 2009 to 2014, at the Army Dental Clinic, Bonny Cantonment, Lagos, Nigeria. Results: A total of 43 cases of cleft lip and palate of varying degrees were seen over the study period. There were slightly more males (n = 23, 53.5%) than that of females (n = 20, 46.5%). The age at presentation ranged from 4 days old to 46 years and the median age was 3 years. In terms of age distribution, patients aged 3 years and below (n = 23; 53%) were the most predominant group. This was followed by the 4–7 years (n = 6; 13.9%) age bracket. Patients aged 8–11 years, 12–15 years, and 28–31 years were equally distributed with 3 (6.9%) each. Conclusion: A significant minority of orofacial clefts patients still present in adulthood possibly due to ignorance about treatment options and poverty to access surgical treatment. Background: Maxillofacial injury has been described in the medical literature as early as 2500 BC. Although, these injuries appear very fearsome. They cause menace to life only, if they obstruct the airway. This is of utmost concern to the anesthetist, because of their closeness to the airway. 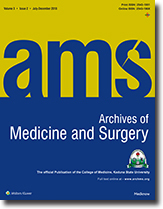 Patients and Methods: A retrospective study of patients who underwent surgery for facial fractures within the period of 10 years in a Nigerian tertiary health care facility. Results: There were 264 cases of facial fracture with panfacial fracture, i.e., 123 cases (46.6%) constituting the bulk. The majority, i.e., 187 (70.8%) were male and the mean age was 33 years. Nasotracheal intubation (213 [81.5%]) was the technique widely used followed by orotracheal intubation (41 [15.5%]). The majority of the patients, i.e. 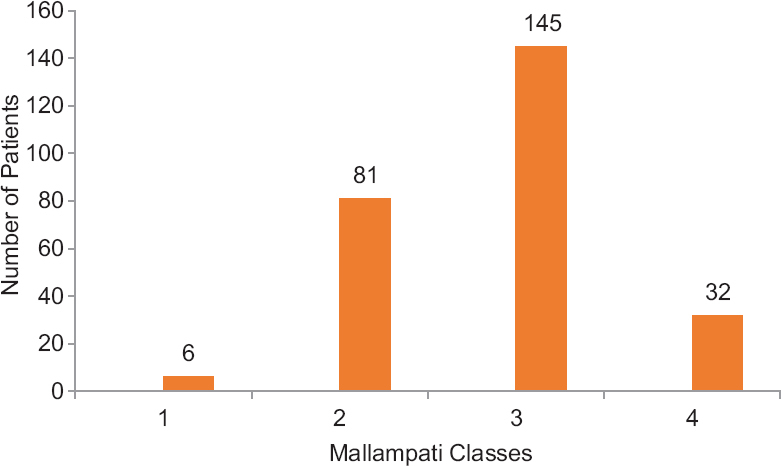 145 (54.9%) was Mallampati III and had advanced airway management. Most of our patients had the American Society of Anesthesiologists II, complications occurred in only 6% of patients. Conclusion: Nasal intubation was the preferred mode of intubation by the maxillofacial surgeons and the anesthetists. Context: Genital infections caused by Chlamydia trachomatis have been a significant healthcare problem recognized throughout the world in recent years. The World Health Organization estimates that approximately two million new cases of genital chlamydial infection occur annually in females. Objectives: The objective was to compare the performance of the glycogen assay test to the polymerase chain reaction (PCR) in the diagnosis of genital chlamydial infection. Materials and Methods: Consenting female patients were consecutively recruited for the study until the sample size of 365 was achieved. Two endocervical specimens were collected from each of the patients using sterile plastic-shaft Dacron swabs. C. trachomatis test kit (Autobio Company China) was used according to the manufacturer's instructions. The test is a biochemical assay for the detection of C. trachomatis in clinical samples taken from the genital tract. PCR was also done for each sample. Data management was done using the Statistical Package for the Social Sciences version 20.0. Results: Of the women studied, 95 (26%) were positive and 270 (74%) negative for genital chlamydial infection using the PCR, while 244 (66.8%) tested positive and 121 (31.2%) tested negative using the glycogen assay. Conclusions: With the results generated above and using the PCR as the standard, sensitivity for the glycogen assay was 86.3%, specificity was 40%, and the predictive value for a positive result was 33.6%, while that for a negative result was 89.3%. The glycogen assay kit is locally available, not expensive (compared to the very high cost of PCR) and often used in the diagnosis of genital chlamydial infection. However, with a sensitivity of 86.3% and specificity of 40% for the glycogen assay, found in this study, the test kit is far from ideal as a tool for the rapid diagnosis of genital C. trachomatis infection, as it will yield high numbers of false-positive results. Background: Cold chain management is a system of transport and storage of vaccines in a potent state from the time of manufacture to the time of administration. Preserving vaccines from its manufacture through administration requires adequate cold chain infrastructure, compliance with standards, and effective management. At the end of the chain, are healthcare providers who should have adequate knowledge to manage the cold chain. Aim: The aim of this study is to assess knowledge, attitude, and practice of cold chain management among primary health care (PHC) workers. Materials and Methods: A cross-sectional study was carried out using a pretested, structured, interviewer-administered questionnaire. A multistage sampling method was used in selecting the 78 respondents. Data were collated and analyzed using Statistical Package for Social Sciences version 23. Data were presented using frequencies and proportions. Results: Majority (71.8%) of the respondents knew the correct temperature range for which vaccines should be stored. 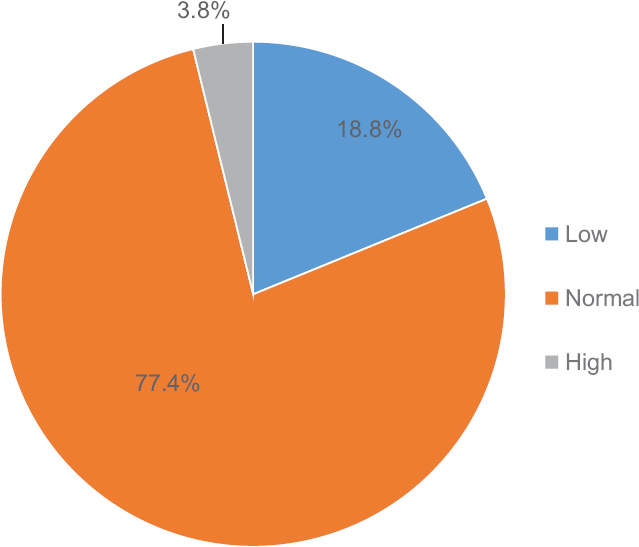 Only 3.8% of the respondents had good knowledge of cold chain management. About two-thirds (75.6%) of the respondents agreed that cold chain management is important. 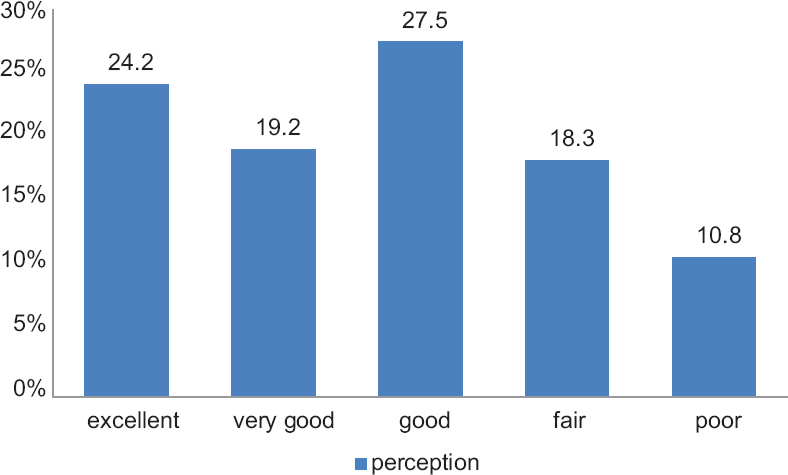 Most respondents (78.5%) showed a positive attitude toward cold chain management. Only over half (51.3%) of the respondents had appropriate practice. Conclusion: This study has shown that the PHC workers in the study area had poor knowledge, about two-thirds had a positive attitude and only about half of them had appropriate practice on cold chain management. The local government department should improve on training and retraining of PHC workers on cold chain management. Background: Street-food vendors play an important role in the etiology of foodborne disease outbreaks. Foodborne disease pathogens may be transferred by street-food vendors to food either directly or by cross contamination. Deeply concerned by this, the 53rd World Health Assembly in May, 2000 adopted a resolution calling on the World Health Organization (WHO) and its member states to recognize food safety as an essential public health function. The resolution also called on WHO to develop a global strategy for reducing the burden of foodborne diseases. This study, therefore, was aimed at assessing the personal and food hygiene among street-food vendors in Sabon Gari Local Government Area of Kaduna State. 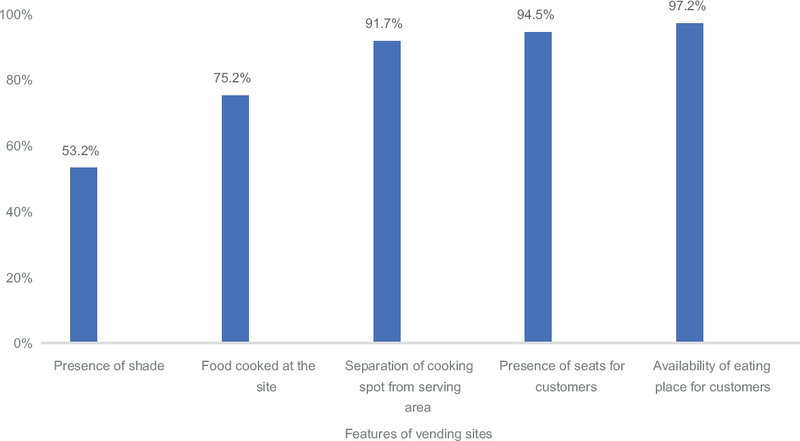 Materials and Methods: A cross-sectional descriptive study was conducted among 109 adults food vendors that sell cooked food or food items by the roadside or open spaces in the streets of Sabon Gari local government area (LGA) using multistage sampling technique. Observation checklist and a pretested interviewer-administered questionnaire with closed-ended questions were used for data collection. The obtained data were entered into a computer, cleaned and analyzed using IBM SPSS statistics version 20. Univariate and Bivariate analyses were conducted among the variables. Associations between categorical variables were tested for significance using Chi-square or Fischer's exact test. Statistical significance was said to be achieved where P ≤ 0.05. Results: Most of the street-food vendors were within the age group 35–44 years (40.4%), while 49.5% of the people who patronized them were passers-by. Half (50.5%) of the street-food vendors normally operate under a shade to sell food to customers. All of them did not receive any formal training on personal and food hygiene. Half (50.4%) of the respondents and 48.6% of them had poor practices of personal and food hygiene, respectively. However, 67.0% of the street-food vendors had a fair environmental sanitation status around their vending sites. Conclusion: The study found that none of the street-food vendors had ever received any form of formal training on personal and food hygiene. Many of them have poor personal and food hygiene practices; however, a significant proportion of them have a fairly good environmental sanitation status around their vending sites. Formal training on personal and food hygiene should be conducted among all street-food vendors in the LGA to improve on their personal and food hygienic practices for the vending of safe food to their consumers.